It is difficult to take your pulse during a workout session. Stopping to measure the pulse rate will cause a drop in heart rate. Heart rate monitors that constantly monitor the heart rate help in evaluating the efficiency of a particular workout routine. A heart rate monitor is critical to athletes and fitness enthusiasts so as to be able to find out the efficiency of their workout and their heart fitness levels. Heart rate monitors vary in cost, features and capability. A strapless heart rate monitor comes with several additional features. Look for the factors that can help you choose a reliable heart rate monitor that is just right for you. A heart rate monitor is a wireless device that includes a transmitter and receiver. The transmitter is usually worn around the chest while the receiver comes in the form of a wrist watch or LCD display. The heart rate is picked up by the electrodes on the transmitter. A heart rate monitor aids in measuring and monitoring the heart rate. This gives feedback on the fitness levels of the heart and its endurance to aerobic activity. Thus a heart rate monitor allows for tracking of cardiovascular fitness. Heart rate monitors come in different options. You can use strapless heart rate monitors that also double up as stop watches and store data. More sophisticated heart rate monitors allow you to download workout data onto your PC. Over time, you can run faster and longer or work out more intensely with a lower heart rate. With a heart rate monitor, you can check for the increased efficiency of your heart. It is an important training tool as it can give you instant feedback on the effectiveness of a particular workout regimen. A heart rate monitor facilitates tracking of the heart rate over the course of an entire workout. 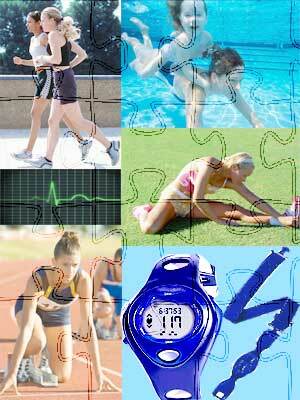 It provides you with information on your MHR (Maximum Heart Rate) and RHR (Resting Heart Rate). For competitive athletes, a heart rate monitor serves to establish an optimum training schedule thereby preventing over-training. You can use the information gathered from a heart rate monitor to draw up a workout that targets various zones of your heart. You can draw up an exercise and workout schedule with varying duration and intensity to derive the maximum benefits. An athlete can stay within the target range of performance. You can customize your workout to complement the heart and current fitness levels. Some models allow calculations such as overall average, disparity as well as loweset heart rate for a workout. Some heart rate monitors also computer VO2 based on the body's consumption of oxygen. Heart rate monitors often allow you to save and analyze your workout data. Look for additional features such as timer, alarm, settings for 2 users and calculation of mileage and kilocalories. You can add beepers if your workout goes above or below the targeted heart rate zone. Some heart rate monitors calculate altitude and ascent too. Temperature readings and BMI calculations are added features on some heart rate monitors. A strapless heart rate monitor allows you to measure your heart rate without using chest straps. You can record accurate heart rates with a strapless heart rate monitor as it?s touch sensors are sensitve to even small increase in heart rate. Within a matter of 7 seconds, you can find your heart rate using a strapless heart rate monitor. Such devices come with internal memory and the captured data can be downloaded to a computer. Strapless heart rate monitors are compact and can be easily carried. A heart rate monitor serves as a safety device for patients recovering from cardiac diseases or surgery. A strapless heart rate monitor while walking or jogging or an aerobics workout. Some models come with the option of using the heart rate monitor with or without the strap, to suit the athletes' needs. You can track calories burnt vis-a-vis calories consumed. Strapless heart rate monitors allow you set heart rate zones as well as calorie target zones. Such strapless heart rate monitors come as wristwatches on which you need to place 2 fingers. In a typical heart rate monitor watch, the impulses are picked up by electrodes and trasmitted to the receiver in the watch. A computer chip residing in the heart rate monitor watch processes the data received to display it accurately and instantaneously. For those using heart rate monitors with chest straps, it is essential that the straps are well connected to the chest. First Published Date: 13 Apr 2006 Last modified Date: April 18 2019 This page may have been updated recently as new information is available or the content may have been edited for better readability.